Italy has more protected foods than any other European country. This includes world renowned foods such as Parma ham, Parmesan, mozzarella and pizza Napoletana. Here we explain the various European classifications of Italian food and wine as well as Italy’s own equivalent system — DOC (Controlled designation of origin). Italians have helped pioneer the use of regional food legislation, in particular to protect the names of wines. The systematic protection of wines had its beginnings in 1900, with the modern scheme being instituted in 1963. In 1993, a unified, Europe-wide system for the protection of traditional foods was introduced, which offered protection for agricultural products as well as a separate, but similar, system for wines. In Italy, the two systems run concurrently, particularly for wine, with the existing classifications generally taking precedence on labels. Despite this dual system, today Italy is the European country with the most protected foods under the EU regime. As with all other countries in the EU, there are three types of European protection available for foods or agricultural products. Under EU law, wines have their own scheme and are classified separately to other drinks and foodstuffs, although wines still bear the same PDO/PGI labels. Modelled after the French AOC system, the denominazione di origine controllata system is dedicated to protecting wines that are made in a specified region, using defined methods, to make a unique, quality product. In 1980, the denominazione di origine controllata e garantita (DOCG) system was introduced, which was said to come with stricter controls and monitoring; wines were submitted for blind taste-tests before sale. Some producers however, felt that the rules for protecting wines had become too lenient, promoting quantity over quality, and had in fact devalued certain products. In some cases wine producers voluntarily declassified their wines to move away from these protected names. In 1992 the system was completely overhauled to bring it into line with European legislation and the EU classifications were also introduced. All wines that were DOC or DOCG were made DOP. However, in Italy this did not result in the phasing out of their native system, which is typically preferred on labels over the new EU classifications (especially winemakers with a DOCG designation). A mandate to switch is unlikely to be introduced until 2020 at the earliest. Fontina is a cheese produced in the unique mountain environment of the Valle d’Aosta, an Alpine valley with specific climate, flora and fauna. 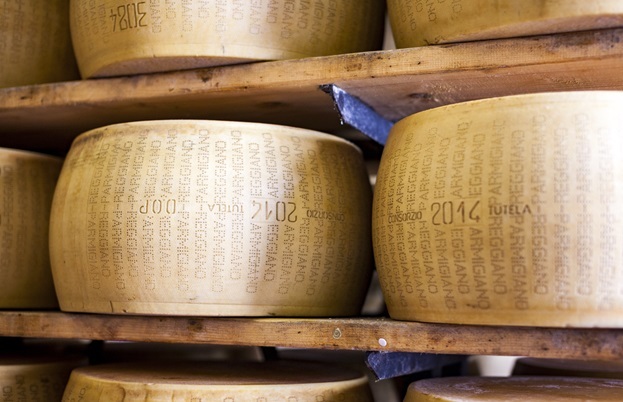 An indigenous breed of cattle, the Valdostana, is used to make the rich milk for this cheese. This breed has evolved in the area and is suited to moving around mountain pastures in search of forage. The cattle graze in the mountains during the summer and in pastureland during the autumn. In winter they must be fed on hay and grass produced in the valley. 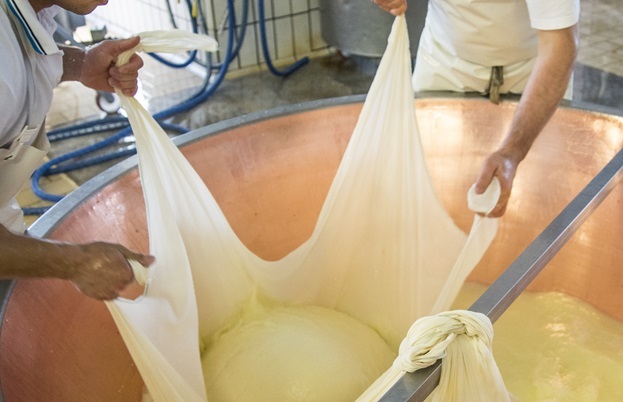 All aspects of the cheese production – caring for and rearing the cows, making and aging the cheese, and the delicate, time-sensitive slicing and packaging of this moist delicacy – take place in the protected area. Production techniques and methods have their root in historical texts (its characteristics were described as early as 1477) and have remained relatively unchanged since. These include the use of raw milk from a single milking, which better retains the unique bacterial flora of the milk, and particular ripening processes which were developed through the use of local caves for aging. The result is a cheese with characteristic rich, nutty, grassy, fruity flavours reminiscent of truffles, with particularly favourable melting properties. The protected area for growing Brindisino artichokes (Cynara cardunculus) covers several municipalities surrounding the town of Brindisi on the Mediterranean coast, in the ‘heel’ of Italy. All stages of the propagation, production and processing of these artichokes must take place in this area. The production area benefits from mild winters and warm, humid summers, as well as sandy soils of coastal origin. This allows for the artichokes to be harvested significantly earlier than other types of artichokes – as early as October in the Brindisi region. However, as this is a climate that is typical of Mediterranean coastal areas, it is the region’s historical and cultural association with these artichokes that secures the IGP designation. Historical reference to the production of these artichokes in the region dates back to the mid-18th century and the local cuisine is distinguished by a large number of artichoke dishes. Specific production techniques, handed down over generations, are employed to produce this vegetable, including harvesting by hand. These techniques have been refined over time to be most suitable for the climate and geography, with the taste, texture, look and smell of the artichokes reflecting these efforts. The result is an artichoke with particularly low fibre content, with tender, flavoursome buds, a dense, fleshy base and a delicate, distinctive flavour. One of only two foods in Italy with STG status, pizza Napoletana describes a method of making pizza that has its origins in the Naples region. While the claim to the name is both historical and geographic, as this is a STG product it is the production method that is protected rather than its production in the region. Therefore pizza Napoletana does not need to be made in Naples to bear the name, it just has to follow the traditional Neapolitan method. The stated raw materials used in making this type of pizza include wheat flour with 11-12.5% protein, yeast, water, tomatoes (peeled or small and fresh), sea salt or kitchen salt and extra virgin olive oil. Other ingredients that can optionally be used include garlic, oregano, mozzarella di bufala Campana DOP (buffalo mozzarella from Campania PDO) and mozzarella STG. The production methods specific to pizza Napoletana cover all aspects of preparing and raising the dough, shaping the dough balls and pizza bases by hand, and baking in a wood-fired oven. The result is a uniquely delicious, handmade pizza with a puffed, raised rim created by the hand-stretching. The dough is soft, tender and easily foldable, and the limited toppings are concentrated, flavourful and aromatic.